According to multiple reports, when it came to standing across the UFC Octagon with featherweight Zabit Magomedsharipov, the line was very short. The organization then picked up the phone and called Kyle Bochniak. The rest, as they say, is history. Bochniak will meet Magomedsharipov at UFC 223. The highly-anticipated event will take place on April 7 at the Barclays Center in Brooklyn, NY. As it stands, the featherweight bout will open up the UFC Fight Pass preliminary card. 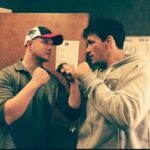 When Bochniak got the call from the UFC offering him this fight, there was no hesitation and no doubt in the mind of the Boston-based scrapper. Following the announcement of the bout, MMA fans around the world had immediately begun to declare Bochniak “a sacrificial lamb” for Magomedsharipov, winner of 10 straight fights, including his first two inside the Octagon. Despite the doubters and non-believers, “Crash” isn’t deterred by the negativity. In fact, it adds a bit of fuel to an already established fire. 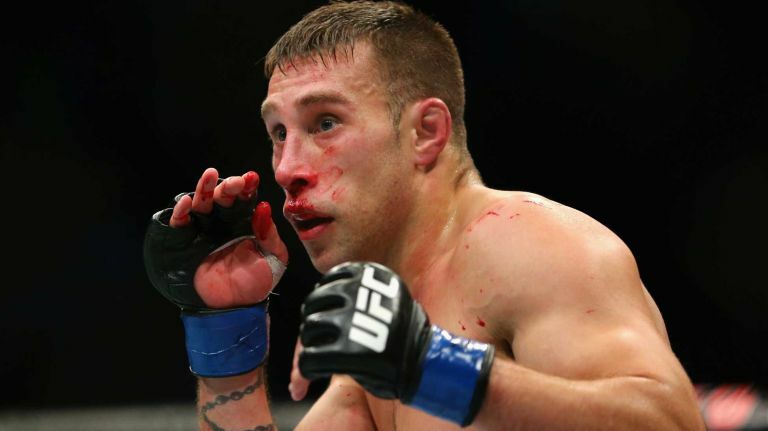 “I handle it fine,” Bochniak said about the fans doubting his chances. “I wake up in the morning, do what I do, do what I’ve been doing — eat my breakfast, go to the gym and train hard. I’m getting ready for April 7. Everybody’s looking past me. They think this kid is going to destroy me. They think I’m just going to lay down for this kid, which is not the case at all! I know my full potential, I know what I’m capapable of and that’s all I need to know. I’m gonna go in there, and when he sees that I’m game, he’s going to start thinking twice. This will be the fifth UFC appearance for the 31-year-old Bochniak. Most recently, he defeated Brandon Davis via unanimous decision at UFC 220 back in January. Bochniak opened a lot of eyes when he made his UFC debut on just days notice against Charles Rosa at UFC Fight Night 81 back in January 2016. Despite losing a unanimous decision, Bochniak gave the veteran everything he could handle and would bounce back with a decision win over Enrique Barzola seven months later at UFC on FOX 21. Magomedsharipov made his UFC debut back in September against fellow newcomer Mike Santiago at UFC Fight Night 115. The 27-year-old Russian fighter lived up to the months of hype by finishing Santiago via submission in the second round. He would return in November at UFC Fight Night 122 against Sheymon Moraes and picked up another submission victory. Despite the impressive resume, and having less professional fights overall, Bochniak feels that the Octagon time he has logged will play a factor on April 7 in Brooklyn. Nothing is guaranteed in this world, especially in a sport like MMA. As confident and motivated as Kyle Bochniak is, the one thing he guarantees is an all-out battle of wills with Magomedsharipov to set the tone for the biggest event for the UFC in 2018 thus far. It’s gonna be a dirty, dirty war,” Bochniak stated. “Someone’s gonna quit and someone’s gonna get finished. That’s the way it’s gonna go. You guys watching are gonna stop doubting me, start believing me and start believing in me. People seem to doubt me all the time and on April 7, they’re gonna say, ‘S**t, this kid’s a savage’ and start watching all of my fights.